Very few details of French made Lambretta's exist, even the national club have very little documentation of their history. 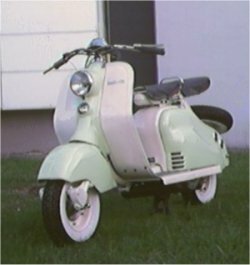 It is thought that the French factory in Troyes only ever produced the D and Ld models of Lambretta, and although very similar, they had their differences from the Italian produced examples. Most notably, were fuel taps and choke levers that were in the same position as 'normal' later model Lambretta's, i.e they protruded through near the floorboards where the riders feet were. Fuel tanks were also offset on LD models, instead of the central position like on later Italian models, making them much easier to fill up! A small plate between the fuel and choke levers, wore the Troyes factory badge. Many of the later models found their way to the UK market, as the Italian market wound up production of the LD to make way for the new series one Lambretta's, the UK market needed to keep up with the huge demand for Lambretta, and so turned to the French models to meet the demand. It was thought years ago by some members of the French Lambretta Club, that the factory stopped producing Lambretta's around 1958, but in fact UK documentation proved that the French were still supplying models as late as November 1960. If you can help in any way, to fill in more details, please get in contact!